I made this roasted beet and garlic pasta / pink pasta for my friend Priya R of Cook like Priya as a virtual birthday treat to her. But because of my kiddo's health issue i could not share this post on time, so sorry Priya but hope you had a blasting celebration with your family and enjoyed gawking other delicious pink dishes made by our friends. This is a simple and healthy Pasta recipe and also a kid's friendly dish. 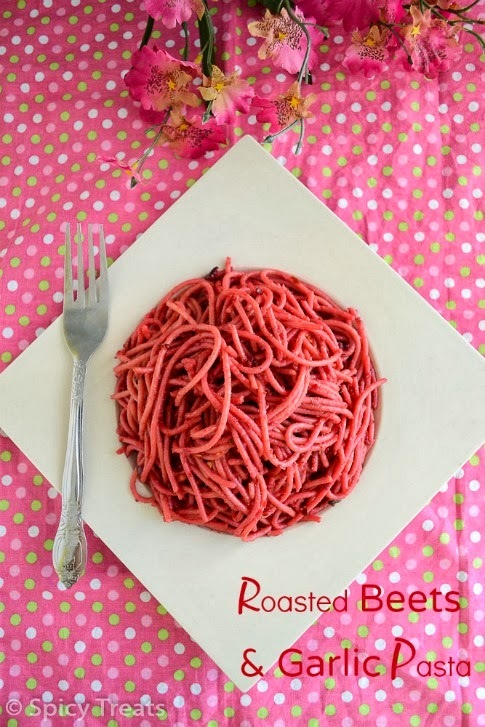 The pinkish red colour pasta sure attracts kids particularly the gals would love this a lot. My boys too liked this pasta but asked me too many questions that why i prepared pink pasta for boys? Somehow i managed to answer their questions and happy that they liked the taste. we decided to share some pink recipe for her virtual birthday treat but I was not sure about the end colour of the pasta since i tried the dish with half mind so i did not take step wise pictures. After trying the ground roasted beet and garlic paste with pasta i got the right colour so took only the end process. If you like cheese feel free to add some grated Parmesan or Goat cheese or serve with a scoop of Ricotta as mentioned in the original recipe. Recipe Source : Slightly Adapted from Simplebites. Prepare spaghetti according to package instructions. Reserve 1 cup of pasta water. Preheat oven to 400 F. Drizzle beets with olive oil and wrap beets, garlic cloves and tomato tightly in foil. Roast until very tender, approximately 1 hour. After removing from oven, remove foil and let cool slightly. Carefully peel beets and coarsely chop. Now in a blender, add roasted and chopped beets, garlic,tomato, 1 tbsp olive oil and toasted almonds and using pasta water blend it to a coarse paste. Then heat a pan, add 1 tbsp olive oil heat it and add chilli flakes let it sizzle and add cooked and drained spaghetti and toss well. Switch off the stove then add ground beets paste and toss well. If desired add grated Parmesan or ricotta and mix well. That's it..Roasted Beets and Garlic Pasta ready. For the light color i added less beets paste and after taking picture, i tossed the pasta with generous beets paste. So add the beets paste according to your taste. I tried mixing the left over beets paste with ildi batter and made dosa for kids. Super vibrant colored plate which is so yummy and healthy too.perfect treat for her aks. Lovely mouthwatering pasta. Nice colour. wow tata a unique one.. 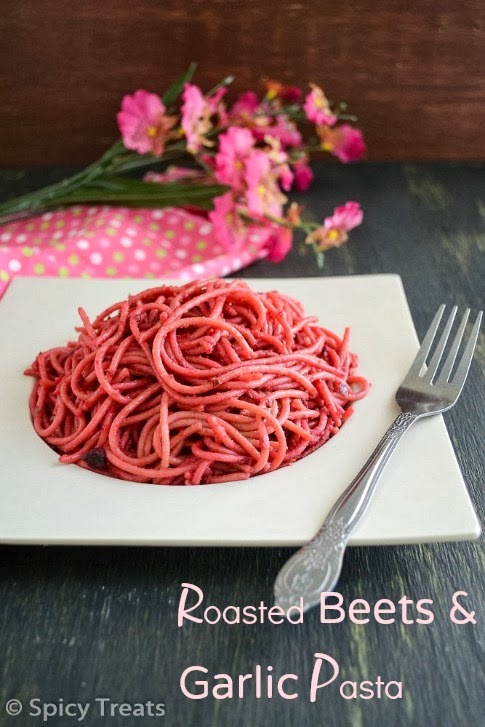 Pasta looks delicious......love the beet root flavor !! 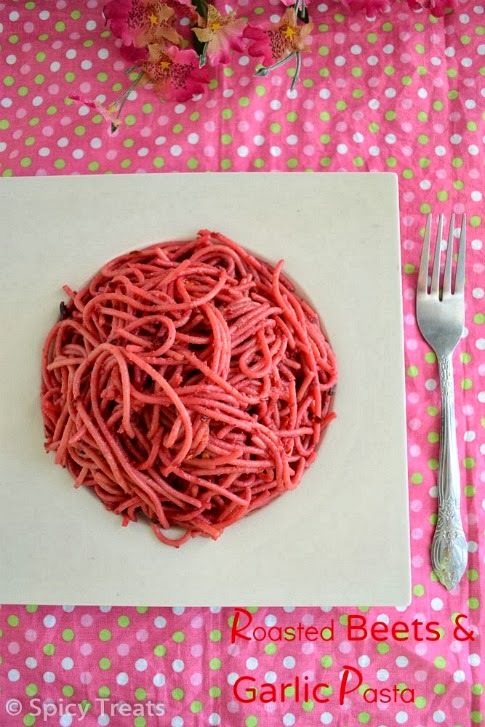 Thats sooo irresistible, wat a fabulous looking pinky pasta, am loving it. Super pink dish akka, looks so perfect!! Wish I was ur neighbor to enjoy this.. Boys epdio samalichutinga pola.. Nice treat for Priya akka.. :) Lovely pink clicks!! 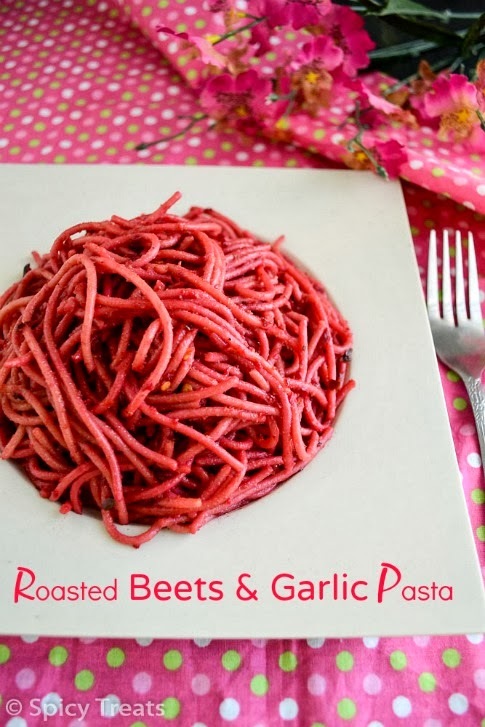 Love the color of the pasta, looks delicious and flavorful with the roasted beets. 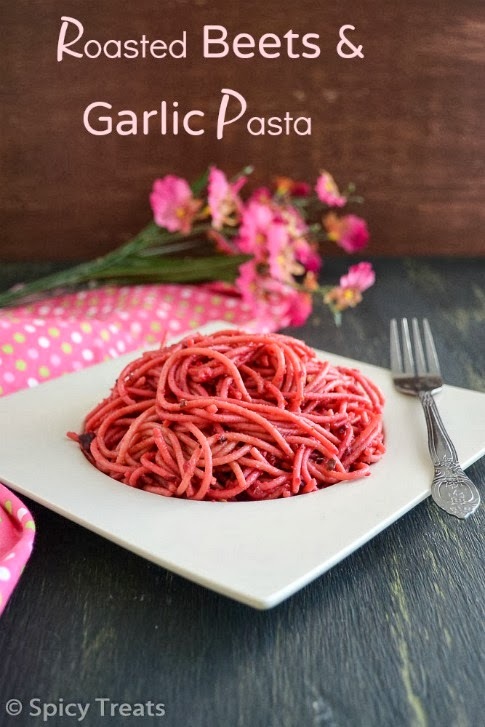 wow awesome pink color pasta looks absolutely delicious and yummy !! love the pink color you got !! On indicator up set your child's authentic age.